Part 2 in a week-long series on parking in the City of Waterloo draft zoning bylaw. 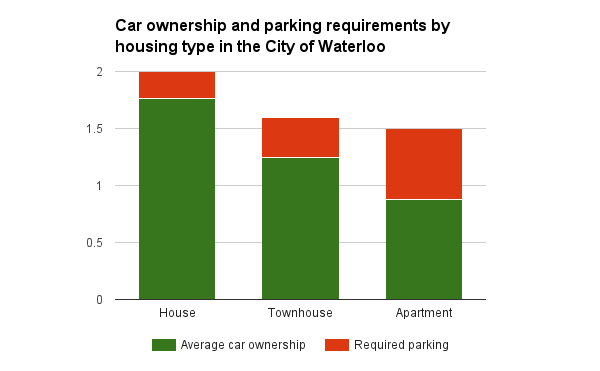 The City of Waterloo’s current and proposed zoning bylaws require significantly more parking for apartments and townhomes than what is needed, raising the cost of housing. If you live in a house, odds are your family owns two cars, and you’re almost guaranteed to own at least one. But if you live in an apartment, a quarter of you own no car at all, and few of you own more than one. The City’s draft zoning bylaw tries to somewhat account for this difference. In residential zones, houses are required to be built with 2 parking spaces (technically 1, but the layout requirements effectively make space for 2), townhouses 1.6, and apartments 1.5 (1.25 + 0.25 visitor’s spaces) . But when you compare these requirements against actual car ownership figures, you’ll discover that apartments are required to carry 70% more parking spaces than occupants actually need, much more than is required of houses. Less than half of this excess can be accounted for by the visitor parking requirements of 0.25 spaces/unit. Car ownership figures for the City of Waterloo are from the 2011 Transportation for Tomorrow Survey, provided by the Data Management Group at the University of Toronto. What impact does all this extra parking have? The website Graphic Parking estimates that a parking space should on average cost an additional $225/month more in rent over a unit with no parking at all. Considering that most landlords charge far less than this amount (if at all) for parking, you could be paying as much as a few hundred dollars a month extra for parking you don’t use as a part of your rent, especially if you don’t own a car. 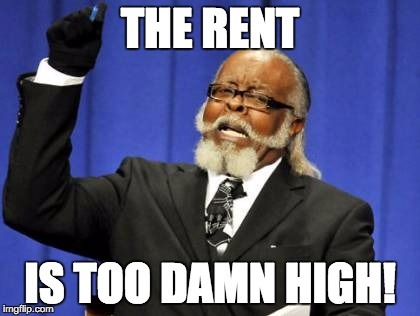 The rent is too damn high! And so are the parking minimums. Ours is a community concerned about the affordability of housing. We should be asking why our zoning rules are making the rent too damn high. Stay tuned tomorrow, when we try to figure out why Waterloo is contemplating tripling the amount of parking required for schools. There are some exemptions. Apartments within commercial zones only require 1 space + 0.25 visitor spaces per unit, and reductions may be applied to rapid transit station areas and major corridors (more on this in a coming post), as staff assume that apartments in suburban areas require more parking than those in central areas. But low car ownership among apartment dwellers is common in both central and suburban neighbourhoods. We should be cautious, however, about trying to set our standards merely based on past patterns, as this assumes that the status quo is the “right” way and that circumstances will never change. Instead, zoning rules should reflect our realistic goals and priorities as a city, informed by these trends and projections. In our circumstances, the City’s and Region’s Transportation Master Plans strive towards significantly increased walking, cycling, and transit use over single occupancy vehicles. We should expect parking needs to decline with time. 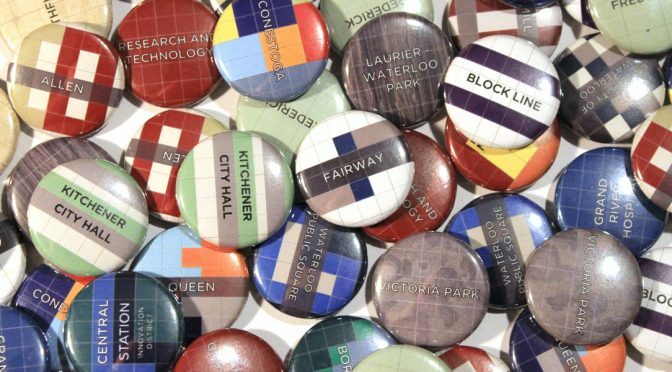 Write to the Zoning Bylaw Review staff and your city councillors, and ask that housing be made more affordable through lower parking requirements in the City of Waterloo’s next zoning bylaw. Photo credit: Maryland Apartments on Flickr, (c) 2014. Licensed under CC-BY-SA. Seems to me, its even worse than this. Take a place like uptown or downtown. There is a large amount of commercial parking around, the parkade, as well as numerous uptown lots. Why shouldn’t the zoning requirement for apartments include zero parking here, with anyone who wishes to park a car purchasing, at market rates, parking in one of the many available parking facilities. 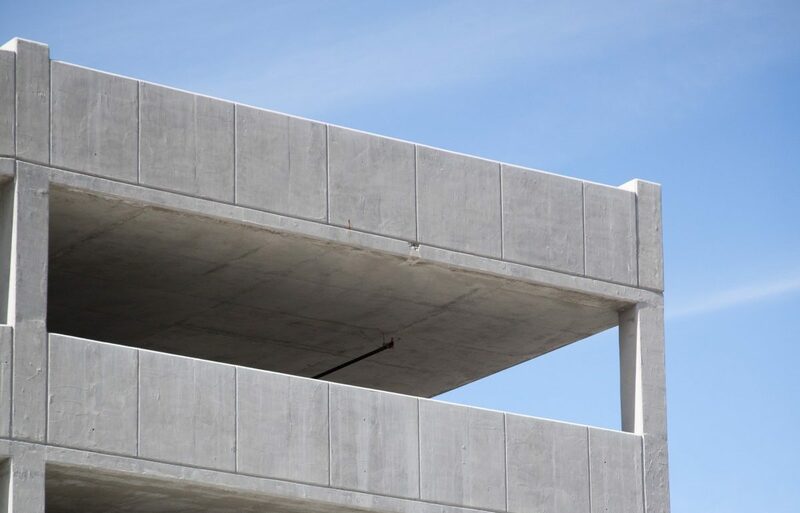 If a building wishes to offer an amenity of your own parking lot, then that is obviously fine, but why require them to in an area which already has abundant nearby parking. Obviously this may increase the demand for parking at some of the municipal lots, but selling parking at market rates seems to be a far better idea. Have a little patience! As noted, we’ll be covering commercial areas and light rail station areas later this week. The City of Kitchener has a pretty good zoning by-law for its downtown (Zone D-1): all land uses are permitted other than industrial, and there is no parking requirement for retail uses. The main downsides are that the maximum height and density are quite low. The height is limited to the width of the street (20 m) and the density is limited to 2.0 FSR for non-residential and 4.0 FSR for residential uses (proposed to be increased to 3.0 and 6.0 in updated by-law). And while retail is exempted from parking requirements, the standard city-wide rates still apply to residential buildings even though they are obviously way overkill for the area.